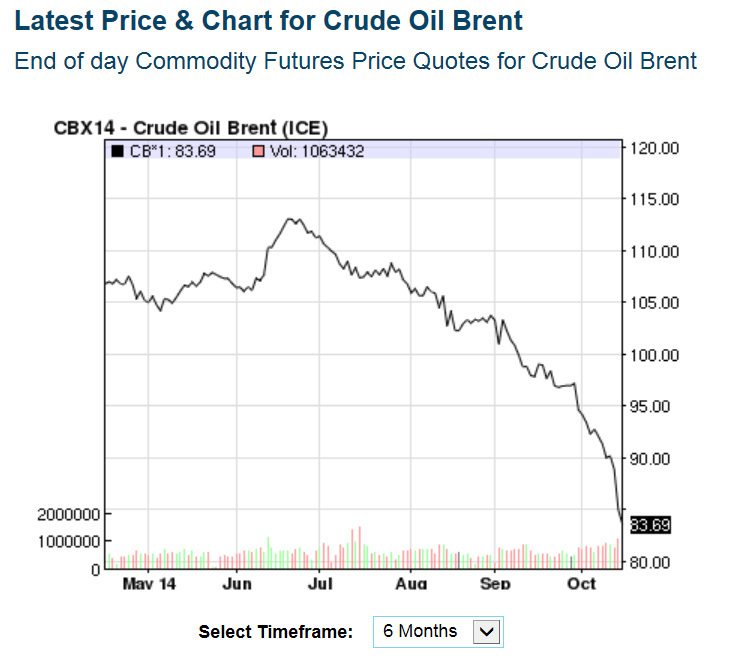 Since July the price of Brent crude oil has fallen from $113 per barrel to $85.62 (on October 14). Historically we saw a similarly rapid fall in the in the oil price in late 2008 followed by the start of the global recession the year after. 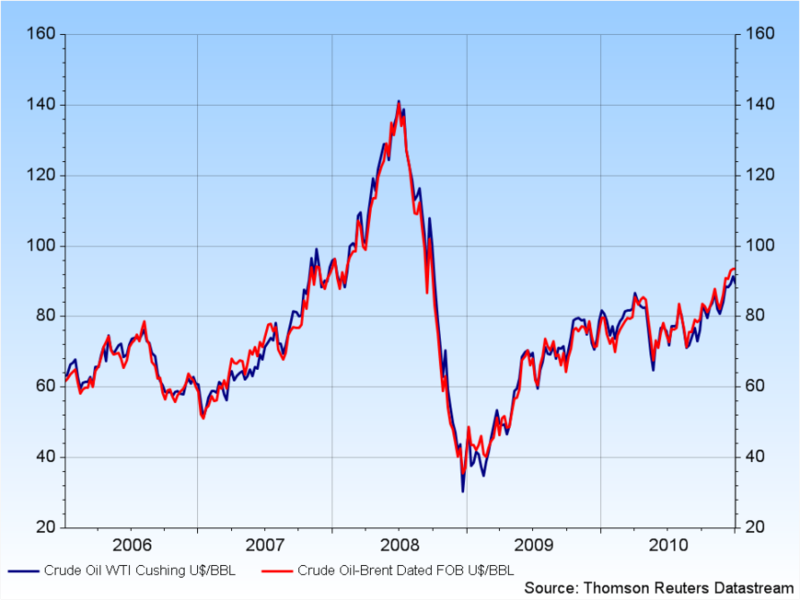 In 2008 the fall from July to December was from $140 down to $40 per barrel. At the moment we see no slowing of the price decline and we do not know how low the price will fall. The fact that increased global energy consumption is a measure of economic growth means that these recent trends are pointing to an economic contraction. Many economists continue to expect that we will recover from the recession of 2009 and, of course, “growth” was also the hallowed word during the recent Swedish election campaign. We who study Peak Oil in 2008 saw the approaching problem – i.e. that oil consumption was not increasing – and raised a warning flag. In May 2008 members of the Global Energy Systems research group at Uppsala University were invited to the World Energy Forum in Leipzig where, in four separate lectures, we presented our research regarding future oil production. Oil, the fuel that powered the world economy’s growth from the mid-1980s until 2005, then began to decline. Unrest such as in Ukraine and the Middle East would normally be expected to cause the price of oil to rise but this has not happened. An important reason for this is that Saudi Arabia has built up enormous oil stockpiles. The changes we see in their oil “production” are, in reality, due to release or otherwise of oil from these stockpiles. Thus they can rapidly change their rate of oil sales by millions of barrels per day. To understand the magnitude of this imagine if Norway, with its production of 1.5 million barrels per day, were to go from full production to nearly nothing and then back up to full production again within only a few days. Compared to 2008 it is now a fact that the USA has increased its own oil production markedly through “fracking”. This new production has meant that the barrel price of US crude oil lies $10 below the world market price. At the same time, the USA needs an oil price of $80 per barrel for fracking to be profitable. The fact that the USA has inflated a production bubble and trumpeted to the world that it will be a larger producer than Saudi Arabia may have frightened OPEC into increasing production to force down the price of oil as a way of putting a stop to fracking. Eagle Ford in Texas is the largest producer of shale oil but if the drilling of new wells there ceases then production from that region will decline by 7.5% per month. The American fracking companies will encounter huge economic problems and it is difficult to predict what will then happen to the vaunted shale boom. Saudi Arabia needs an oil price of over $80 per barrel to support its domestic budget but that nation’s oil fund is so large that it can absorb losses for several years. The GCC nations, Saudi Arabia, Kuwait, Bahrain, Qatar, UAE and Oman, possess approximately 40% of the world’s remaining reserves of easily (cheaply) producible conventional oil. Their production costs can vary between $5 and $15 per barrel. At the moment the GCC nations account for 25% of world oil production. The fact that they possess a larger proportion of world reserves than their proportionate contribution to current world oil production means that, in the future, production from the GCC will become all the more important for providing oil to the world market. Economists usually regard mineral resources as a pyramid where the highest quality ores at the top are exploited first. As technology is developed and improved, resources closer to the base of the pyramid that are more difficult to exploit can be accessed. This image has also been used by economists to describe oil reserves. However, the reality for oil is a little different and this means that many economic models make mistaken assumptions about future oil production. At the top of the global oil pyramid is conventional oil and we know now that that the initial available volume of this resource was around 2,200 billion barrels. According to the resource pyramid idea reserves of unconventional oil should be at least double this, i.e. 4,400 billion barrels. The volumes of the unconventional oil reserves are now estimated as: Canada’s oil sands, 170 billion barrels; Venezuela’s Orinoco oil, 300 billion barrels; Shale oil in the USA, 90 billion barrels; oil from deep water, 50 billion barrels and an unknown (but presumably fairly limited) amount of oil in Polar Regions. These unconventional reserves do not even total to 1,000 billion barrels. Oil is produced from these unconventional reserves but requires an oil price of over $70 per barrel to be profitable. The very difficult oil production from the Kashagan field in Kazakhstan requires $120 per barrel. The over-production of conventional oil that we are currently seeing from OPEC may be a way of marginalizing production from these unconventional reserves that generally require an oil price of more than $70 per barrel. We can speculate regarding the reasons for the rapid decline in the price of oil but we should be aware of the fact that this may signal approaching problems for the world economy. It can be difficult to understand that lower oil prices will cause a recession, but it was the 2008th high oil prices that pushed down consumption and there was a surplus of oil that caused a rapid fall in prices. The International Energy Agency (IEA) has now reduced its prognosis for world oil demand by 200,000 barrels per day on the grounds of reduced economic growth. It is time for our economists to take the concept of limited oil resources seriously. The economic growth rate of 3% that Sweden’s finance minister is hoping for next year could rapidly be reduced to zero. Your excellent article continues to challenge anachronistic views of economics. What would the effect be upon prices, if the mad men of Syria and Iraq wrestled control of the oil fields? Would they shut down the free world with massive price hikes? I doubt that they would be inclined to want to let the “West” off without causing considerable harm to our collective GDP. Prof Michael Klare sees the Syrian/Iraq conflict scenario escalating over time, as the “best first oil” slowly disappears and the race for whats left heats up. Reproduced from Prof. Aleklett’s blog. He explains the signs that we’re on the edge of a new recession. The reason is the lack of energy to drive the economy. And the lack of demand to drive up oil prices. The world market price on iron ore has fallen 40% during this year. In Sweden it resulted in the bankruptcy of the mining company Northland. This is in line with the falling oil prices: someone is consuming a lot less. Is something going on in China? Jag blir inte klok på hur sweet crude oljan kan vara utbytbar mot oljan från fracking. Är det 1-1-förhållande så att det blir lika mycket bensin/diesel från ett fat fracking-olja som från ett fat sweet crude? Hur räknar man egentligen? Jag trodde att fracking- och oljesandsoljan var både dyrare att extrahera och att man måste pumpa upp mer för att få ut lika mycket lättanvändbara produkter. Men det verkar som att USA kan sänka sin import med precis så mycket som de tar upp. Kan du förklara på ett någorlunda lättbegripligt sätt? Mitt svar blev en egen blogg. You write that low oil prices cause recessions. This sounds absurd (!). IMHO the causation is the opposite, i.e. high oil prices cause recessions -> recessions reduce demand for oil -> oil prices drop. Sure, lower oil prices can be used as an indicator of lower economic growth/contraction (assuming elasticity of supply is low) but that is because low oil prices are a symptom, not the root cause, of a recession. Hamilton, for example, has written a lot about this. I don’t think Prof. Aleklett said that low oil prices cause recessions. He said that a falling oil price is presaging a recession. The oil price is falling because economic activity appears to be contracting while the Saudis are putting greater flows into the market. The Saudi’s would be hoping that cheap oil will stimulate the world economy, particularly in Europe, and that it would simultaneously make life difficult for the American frackers. Whether the market will be greatly stimulated is open to question – there may be a relative uptick but the western world is now so deeply indebted that it cannot afford a great deal in future investment. Last column: “It can be difficult to understand that lower oil prices will cause a recession”. This statement can also be found in the original Swedish version. I do not understand people’s refusal to accept peak oil and that oil will end eventualy. It is so easy just think of it. If you have a pint of lager and you drink from it eventualy the glass will become empty. Easy or what ???? Why dont people get it ? Are they so moronic? What prof Aleklett is saying is that cheap oil dont bring a recession but with lower world production of goods – less energy needed to produce the goods – less oil needed – oil goes dont in price. And so lower world goods production = recession = lower world production. If or when there would be an end to this recession the asking for more energy/oil will inevitably put the oil price up. Think of it this way as if at an auction. If only one person is bidding he will likely get the object at the opening price. If many are bidding the price will go up. So no global recession, more goods are produced , more oil is needed. Price will go up. Eventualy oil will finish. Not overnight of course but slowly, when one after another every oil well becomes empty. As an example : from a million barrels per day to one thousand or less. Thats when oil becomes really expensive maybe 800% higher or more. The problem will be of a fuel nature rather than energy when there will be a shortage of oil. There is approx. 700 million vehicles excluding airplanes world wide. 1. Price of oil falls (the first cause of the drop is subject to speculation, modeling, and discussion herein and at other blogs, e.g. Chris Martenson). Price drop is a fait accompli now (Nov 2014). 2. Producers who have taken out big loans from banks to expensively drill and frack, and who must keep drilling new wells to pay off loans for their previous drilling, may collapse financially and walk away from their leases, their drilling equipment, their contractors and their loans, declaring bankruptcy. Managers have safely stashed their profits to date. The time frame for this may perhaps take place over 2-3 months; very uncertain. 3. In a process similar to the subprime mortgage collapse of 2008-09, the banks lending to the frack drillers again encounter risk of collapse with *their* creditors, and the financial global sector rapidly freezes all credit. 4. After that one may only make educated guesses. Just as silver, gold, interest rates and the value of money the oil price is also manipulated. The USA wants to bring Russia on its knees since Russias economy is heavilly dependant on oil this is a great way of doing it. Large scale production in the USA of “cheap”shale oil is flooding the market. We just have to pray that the bear doesn’t bite back(or is this the intention?) Money can be best earned when there is blood on the Streets. Whenever I am abroad I like to go to farmers markets just to see their produce maybe even buy something. What I have come to realize is that at the end of the days business whatever produce they (the sellers) have left, they choose one of two things to get rid of their leftover supply of anything from say 5 to 15 boxes. They try selling it at an extremely cheap price per box and not per kg anymore. Or they throw it in the container near by so as to get rid of it because they know there is not much left not as if they have a truck full of the produce of which such quantities will obviously ask to be stored in a cooler for the next business day. I have seen these procedures in every country I have visited. Now you say what farmers markets got to do with oil right? Lately I began to compare the price drop of oil to farmers markets. Is it maybe we have pasted peak oil for quite some time and we are now seeing the end of oil? World recession equals drop in oil demand. Is it because of shale sand/oil/gas competition? Maybe to make the Russian economy suffer? Or maybe keeping what little oil is left for the so called elite folk or globalists that conspiracy theorists talk about? Or maybe just maybe its going the farmers markets way as I explained above. When i said farmers markets i actually meant produce or vegetable markets. vegetables and honeys and jams etc. which you see once a month , sometimes a few times a year selling their stuff. These are the once people should support.